The Obama Foundation wants at least half of contracts to go to "diverse suppliers." 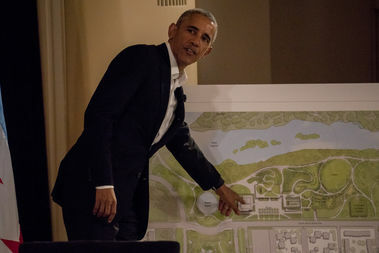 WOODLAWN — The Obama Foundation is asking the four construction teams vying to build the presidential center to set high standards for local and minority hiring. The foundation announced four finalists Thursday morning and also the standards for hiring the foundation is setting for each. Each of the firms has to lay out how it would meet a commitment to awarding half of its subcontracts to “diverse suppliers,” which expands the normal definition of firms from women and minority-owned firms to also include veteran-, disabled- or LGBTQ-owned firms. As the definition of inclusive hiring is broadened, the foundation is specifying that at least 35 percent of contracts need to go to minority-owned firms. Each of the firms also has to detail how it plans to recruit and retain employees from Woodlawn, Washington Park, South Shore and the South and West sides more broadly. It’s not clear what would happen if the firm chosen fails to live up to the set standards. Community groups continue to push for a community benefits agreement that would codify the standards and create repercussions if they’re not met.